Two Meatballs: Nohm You Didn’t!? Ohm Yes I Did!!!!!!! and this past Saturday was graduation!!!! I made it. We Made IT! 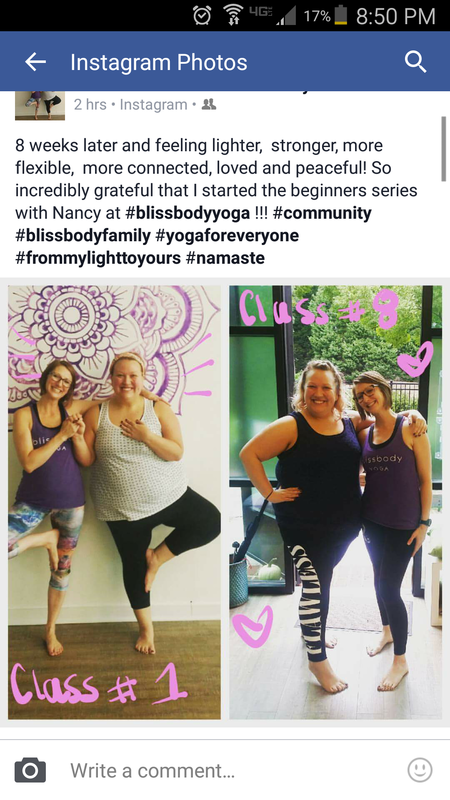 I made it to every single class and even got inspired to try new classes and start a new challenge of 20 classes in 31 days! I love these gold stars! #8 I’ve met amazing new friends #9 I LOVE YOGA #I have found peace, contentment, breath, honesty, forgiveness, light, love, acceptance, calm, energy, truth, beauty, and how to really be present! #10 I have found a new way to spend time with the people that I love! I cannot say enough about how lovely this class is. You just melt into the floor and the only thing you need to do it breath…heaven! She asked us to listen in the silence to what pops up and for me it was a calling to do more. I have so much and I want to give back more!!! Here is a perfect opportunity! Please give if you can, If you have something that you would like to donate I can bring it to the studio for you, or you can come take a class with me winky face! And I love sharing this restoration with my friends!!! Then Kelly was signed up for Flow Yoga right after this nap and I decided to face my fears, be brave and try my first full blown, fast paced flow class…and I survived!!! Thanks Kristina for being gentle with me!!!! Kristina’s class was all about your 5th chakra which is your throat, your voice, your truth and creating space and length in the neck! Kellllllly, thanks for always being so supportive! You guys, it was like sweat pouring off of you hard, buuuut I totally held my own and only had to come out of the poses a handful of times. 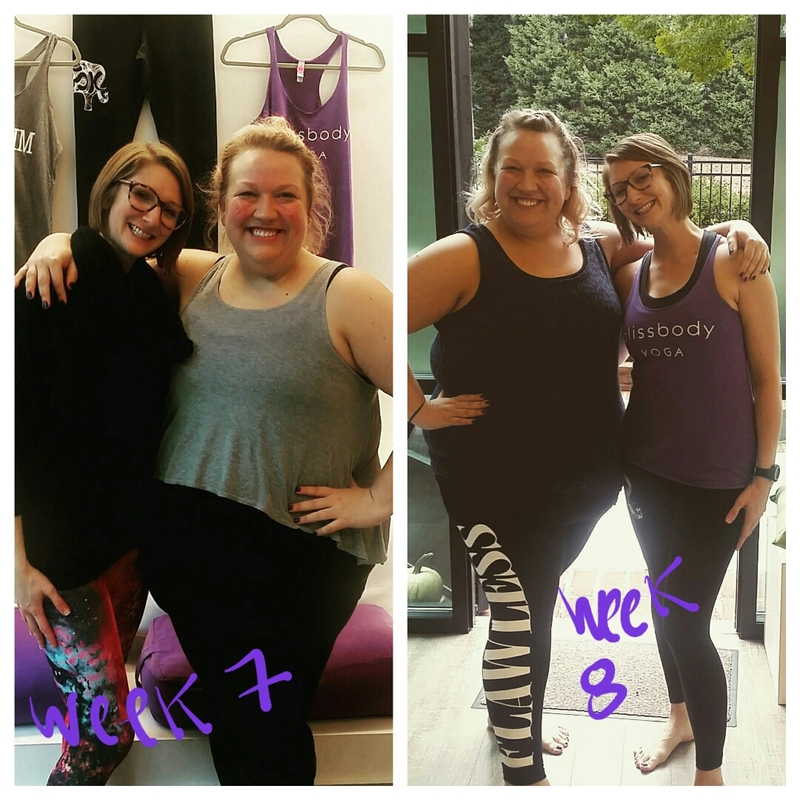 It is amazing how much of a difference 8 weeks and the loving embrace of a new yoga studio can make!!! Are you guys on board yet, have you signed up to get to know yourself and the rest of the word better!?!?!?!?! In closing, I have officially done my first 3 a day workout, I am a Beginners Series Graduate ( a thank you very much), I survived my first flow class and I am closer to my self and everyone that I’ve had the pleasure of practicing this wonderful gift with. Look at the difference!!! If anyone wants to come to a class with me, I WOULD LOVE THAT! Just message me and lets get our bliss on. I literally love every single one of you and I am grateful everyday that you read our journey. Through all of the ups and downs of me and Jenny trying to get healthy, you guys have been the one thing that has never changed, and we love you for that. From my light to yours, namaste. ← Two Meatballs: Rain Rain GO AWAY!!! Love you so much, can’t wait to go to class together again! Cannot wait for Saturday!! I am so excited!!! Love you, Mo!!!! Ahhhh!!! Me too! Love you mom! Yisters for life!!! I live this and you and am so thankful you’ve found yoga and I’m coming back to it!!! Thank you Heather! Appriciate all the support! Looking forward to future yoga adventures! !